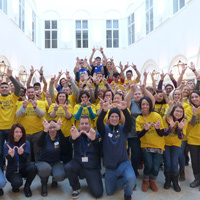 New students make a Webster "W" in the Palais Wenkheim, home to Webster Vienna. A new year means a fresh start and a new batch of Gorloks at campuses throughout the Webster University network. At Webster Vienna, a team of student volunteers, staff and faculty members welcomed new undergraduate and graduate students plus current Webster students studying abroad in Vienna to campus at Palais Wenkheim. The week started off with a new student orientation (NSO), activities from the Student Government Association (SGA), and the student coordinator. New students got to know about Webster, each other, and Vienna. At the NSO, there were workshops and information sessions to get the students familiar with the American education system at Webster. 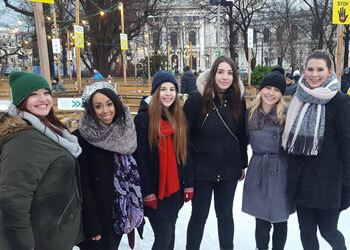 After the orientation, students got together and participated in activities that included: a trip to IKEA, bowling, an Austrian-style dinner, and ice skating at the famous Rathaus (city hall). Thanks to all of the New Student Orientation Leaders from the Webster LEADS program who volunteered their time! See more photos in this Webster Vienna Facebook album, with more info at Webster Vienna's site.